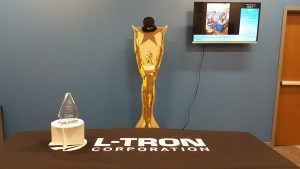 Western NY Company, L-Tron Corporation, wins prestigious AMA Pinnacle Award from the American Marketing Association. 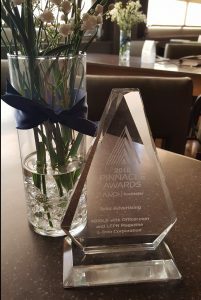 L-Tron Corporation is pleased to announce that its Marketing Team won the ‘Best in Print Advertising’ award at the 2018 American Marketing Association (AMA) Pinnacle Awards in Rochester, NY on May 17, 2018. The philosophy behind the AMA Pinnacle Award is to honor marketing teams with proven results. L-Tron’s “M-Team” was recognized for its print advertising campaign published in Officer.com in the March 2017 Edition of Law Enforcement Product News. The award-winning 2017 advertising campaign in Officer.com featured L-Tron’s 4910LR Driver’s License Scanner. Print ads in the Law Enforcement vertical need to quickly grab attention using visuals that resonate. The 4910LR print ad approach was a result of improvements L-Tron’s M-Team made by analyzing metrics and data from previous year’s metrics for print ads. The goal of the print ad was to increase 4910LR sales, the 2017 ad campaign performed 4-times better than the previous years’ ad. Click to read more about the entry. – Carly Perez, President at Divine Design & Marketing, Inc. The American Marketing Association is a national organization with chapters across the United States. This year’s judging process was conducted by the AMA chapter located in Columbus, OH. 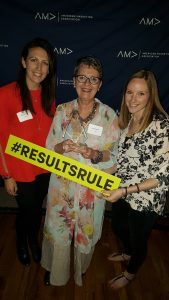 Award finalists were selected based on a scoring rubric that measured strategy, execution and, the highest scoring factor, measurable results. For more information about the AMA Pinnacle Award, please visit http://www.ama-rochester.org/events/2018-pinnacle-finalists/. L-Tron Corporation’s Marketing Team started just over seven years ago. There was a Director of Marketing position open within L-Tron, and CEO RAD DeRose asked Gayle to take on the challenge. Gayle runs to a challenge. Her first introduction was a book she purchased, titled ‘PPC for Dummies’ and her love for learning continued from there. The true gift was a door opened to a new passion and a new career. This passion and drive led her to develop the team we are today. That team is made up of the best – we teach and learn from each other every day by working alongside and together. Starting as a team of one, the rest is history. Our expertise spans across every marketing platform from traditional marketing to digital marketing. Our goal is to continue to get better every day. We deliver results, we are fierce. Questions? 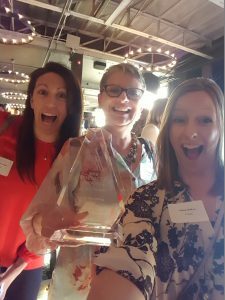 Interested in learning more about the AMA Pinnacle Award?